Since 1956, CHIN FU MACHINE has been a leader in the research, development and manufacture of high quality bamboo and wood processing machinery. 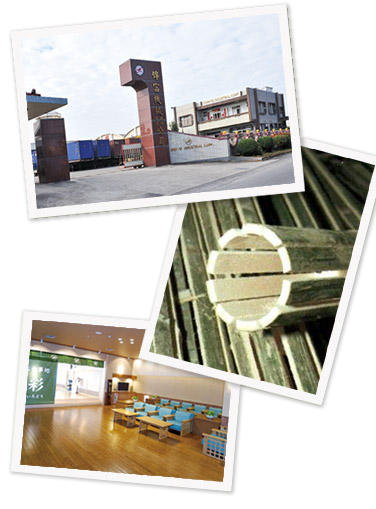 After many years of research we have developed and patented machinery for the production of high-quality bamboo flooring, paneling and boards for the construction, interior decoration and furniture industries. Bamboo flooring and bamboo board are the newest and most revolutionary products in woodworking industry. Using CHIN FU MACHINE bamboo sticks are made from the bamboo pole, then hydraulically laminated under high and pressure;the resulting boards are then sanded, molded and finished similar to wood flooring. The finished product is protected against fungus and insects. Bamboo flooring and bamboo board manufactured with CHIN FU MACHINE has been fully tested in labs in America, Europe, Japan and been shown to superior to most hardwoods in terms of hardness, stability and fire resistance. Bamboo board has the additional advantage of being made from an abundant, renewable natural resource: bamboo. Unlike trees, which take decades to replace, bamboo groves fully rejuvenate within several years. Considering deforestation and increasing environmental consciousness, the market for bamboo as a wood substitute--and beautiful decoration product in its own right--will only increase as it begins to be applied for a variety of functions:flooring, paneling, furniture, gift items, etc. The natural beauty and elegance of bamboo leads to its acceptance as a high -end interior decoration product. This brochure presents a complete, integrated line of specialized machinery for making bamboo flooring, paneling and boards from the raw bamboo th the finished product. This includes bamboo cutting, splitting, drying, sizing, gluing, pressing, molding, sanding and UV coating machines. CHIN FU MACHINE also provides complete training and know-how transfer giving you the most complete, professional and reliable service available. We have the ability to tailor a complete line of ture-key machinery according to your needs. Please use this brochure as the basis of your inquires and if you need any information, please do not hesitate to contact us.